Measuring 6" x 13 3/4", this Bigz XL die showcases the bold and edgy style of Tim Holtz®. This die is designed for use only with the BIGkick, Big Shot and Vagabond machines and requires the use of a pair of Extended Cutting Pads and 6" x 12" paper. 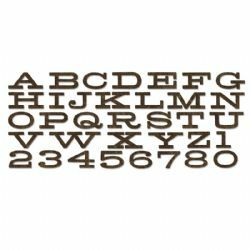 The letters measure approximately 1 1/4" tall.